Why should you start walking? Why wouldn’t you like walking? It’s the exercise we do the most after all (without even our knowledge sometimes). Taking it up as a daily workout can work wonders for your health too. We do not mean the normal dilly-dallying! We’re talking about walking at a faster pace, also called brisk walking. Did you know brisk walking is great for your body and aids in weight loss too? Well, yes, it’s proven and true. So what’s better than walking? Let’s dig a little deeper, to know about the numerous advantages brisk walking will have on your over-all health. Brisk walking works wonders for your heart. You are lesser prone to cardiovascular diseases, and the risk of being attacked by a stroke also decreases. It helps to fight ‘bad’ cholesterol levels, and increases ‘good’ cholesterol levels on the contrary. It also aids in regulating blood pressure levels. Regular brisk walking can help to ward off a number of diseases and keep you fitter. If walking is your everyday hobby, you are less likely to be attacked by bowel, womb or breast cancer. It can also help to fight diabetes and high blood pressure. Did you just mention weight loss? Well yes, brisk walking can help to curb calories and aid in weight loss. You can burn about 75 calories by walking at 2mph for half an hour. If you increase your speed to 4mph, you can lose 150 calories. 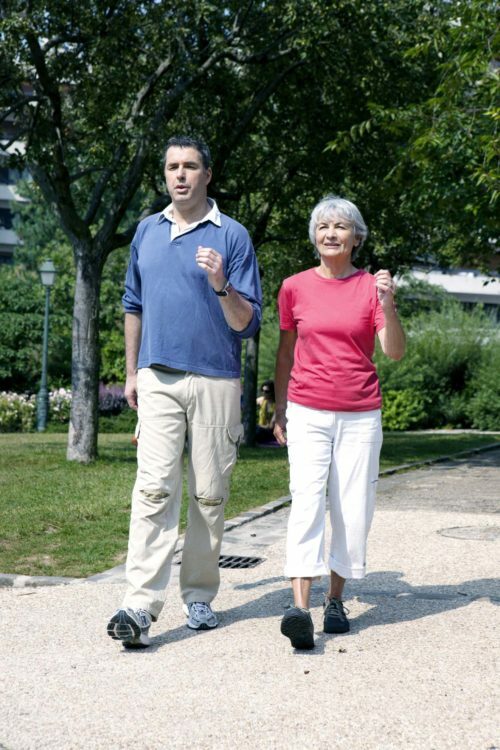 By incorporating brisk walking into your daily routine, you can shed kilos in no time. It improves your immune function. Walking has a great impact on the body’s immune system. Just 30 minutes of walk can help to increase T-cells and other signals of immune function. Women who have reached their menopause, can also improve their immune system and fight hurtful immune effects, by taking up brisk walking as a regular activity. Your memory power will not shrink. It has been found that older people who walk more than 6 miles per week, are less prone to develop brain shrinkage disorders, or experience loss of memory as in case of dementia, or Alzheimer’s. Since dementia affects almost 1 in every 14, sixty-five above aged people, walking may not be a bad idea at all. Brisk walking will help to shape up your body. Walking is an exercise where your entire body is put to work. Your calves, quads and hamstrings are worked upon regularly when you lift your glutes (muscles in the bum). Hill walking will prove even more beneficial to tone your muscles. If you also pay a little more attention to your posture, you’ll get toned abs and waist too. While brisk walking, your breathing rate increases by leaps and bounds, resulting in the oxygen to travel faster in the bloodstream. This in turn helps in improving your level of energy and also betters the ability to heal faster. Walking releases natural painkilling endorphins in the body, by lightening your mood, that ultimately makes you happier. The feeling of putting your body at work, is a good one after all! Read More: Exercise- How to get motivated?